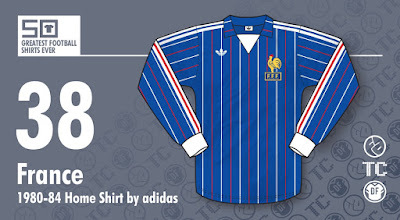 Forgive me for taking a slightly anglophilic approach as I look back at this beautiful France home kit, worn from 1980 to 1984 by the likes of Michel Platini, Jean Tigana and Dominque Rochteau. Although designs such as this may have been common on the continent in the early 1980s, in the UK at the time this manner of football clobber was the very peak of foreign glamour and mystery. Especially when you consider so many British contemporary kits of the era were still stuck in the 70s. Adidas, who to be fair were only relative newcomers to the football apparel market by 1980, were clearly enjoying a golden age and looking back now could seemingly do no wrong with their designs. But what made their strips of this era, and this shirt in particular, so special? Pinstripes didn’t really arrive in the UK until the following year so to see this adornment on previously plain colours was tremendously exciting! To see them in different colours AND then also continuing on the collars was almost too much to comprehend. Dual colour pinstripes never really took off to a great extent in England for some reason and seeing them on collars was rarer than a Balotelli goal for Liverpool. Another key aesthetic element was the enhancement of the collar with a vital ingredient of a contrasting white insert panel that accentuated the self colour of the collar and helped give the shirt a touch of Gallic swagger. 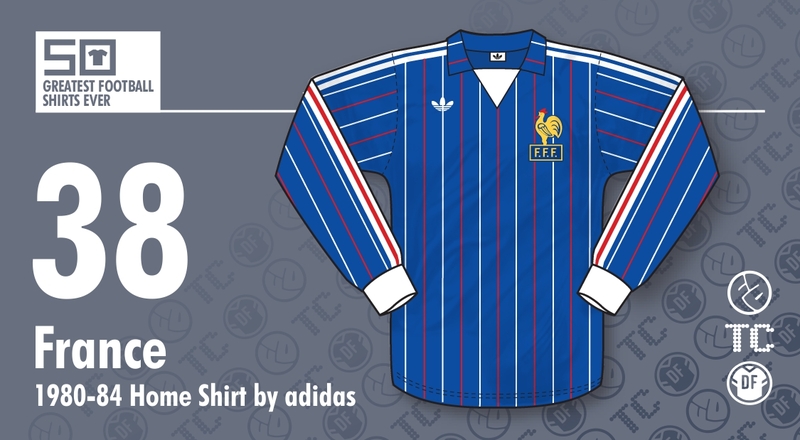 The traditional French tricolore rendering of the Adidas three stripes, the low-slung FFF badge, dainty Adidas logo (minus text) and slim fit all enhanced the shirt’s greatness. This shirt was actually only worn in a long-sleeved version with a much more sober white v-neck prefered for the short-sleeved incarnation. However, by the 1982 World Cup, a more faithful rendition of this shirt emerged with the white insert replaced by a V-neck, presumably to combat the Spanish summer heat. Its a peach of a shirt that looks as good now as it did then when it symbolised the difference between the panache of European football fashions compared to ours over in Blighty.